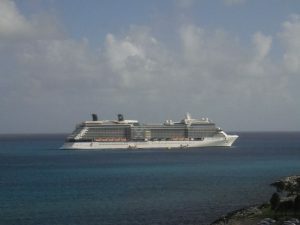 In late January 2012 my husband and I set off for a 7 night cruise on the Celebrity Solstice for our belated honeymoon. We were married in June, but, coming from Michigan, we did not really want to go anywhere tropical in June. (Our summers are very nice.) We take a winter trip every year and thought we would make this one a bigger trip since it was our honeymoon. The Solstice was the perfect way to spend the week. We splurged and booked an aft cabin S2 Sky Suite. It was the perfect decision. Our Eastern Caribbean 7 night cruise had 3 sea days and stops in San Juan, Puerto Rico, Phillipsburg, St. Maarten, and Charlotte Amalie, St. Thomas. We picked this itinerary, travel dates and ship based purely on price. I knew I wanted a Suite on a Celebrity Solstice class ship in late January early-ish February and let price dictate which ship, what date and which ports. I have been on many cruises and was familiar with the ports on both the Eastern and the Western Itinerary cruises. Our honeymoon started the day before the cruise with our continued splurge and use of frequent flier miles to upgrade ourselves to first class. Travel Tip- when picking your seat, pick a seat in the middle of the first class cabin. With this cabin, closest to the front is NOT better. The first row is out because there is no personal storage space, you have to use the overhead bin, and then have to move every time you want to access your personal items. The second row (our row) was a bad choice because they place the travelers with small children in the first 2 rows. Either the first or second row on many planes have the extra air masks if there was a loss in cabin pressure for a lap child. (Children under 2 sitting on their parent’s lap and not in a seat.) We had a 2 year old in front of us. Parenting Tip: parents please bring something to entertain your child that is not electronic. This way you have something to do with them during the taxiing, etc. The child in front of us opened and slammed the window shade and banged his chair back as his entertainment until electronics could be used. [Edited to point out, that I now have a 2 year old, and my child, which still a kid, and can be a little loud at times, never slams the window shades, nor slams back in his seat. Finally, we have never had to use the phrase, “he’s two” to explain his unacceptable behavior in a plane, unlike the lazy parent in front of us.] Also, the sound is much more muddled in the rows not immediately in front of or behind noisy rows. Unfortunately there were no other seats that we could move to, so that is where we stayed. The other disadvantage of being too far back or too far forward is you may not get a choice of which meal you are served. On Delta they offer 2 choices, and there are only as many meals as there are seats- so, if they have run out of one choice by the time they ask your row, you are left with what’s left. (On the way to Ft. Lauderdale the flight attendants asked the last row what they wanted to eat first, on the return flight, the front row was asked their choice first.) For those travelers in the middle of the cabin, they received a choice for their meal preference, and were far enough back not to have to hear bored 2 year olds. Quite a few cocktails and an inflight movie later, we arrived in Ft. Lauderdale, obtained our luggage, and were off to stand with the crowds of people waiting for their hotel-provided airport shuttle. There are no shortage of hotels that provide airport shuttles at FLL. We stayed at the Holiday Inn Express, Davie Rd. For information on that stay, click to see my review. The next morning we took our privately hired transportation to the cruise pier. We arrived around 11:10 a.m. The pier is CLOSE to the airport, if you are flying in on the same day just take a taxi to the pier. Same is true if you fly into Miami and cruise out of Miami. The porters took our luggage and we entered the terminal. We quickly made it through security, and check-in. Our picture was taken, and then we waited for it to be time for boarding. Cruise Tip: Arrive nicely dressed for your cruise. They take your picture in front a back-drop and the photos turn out nice some of the time. There is no charge for ‘sitting’ for the picture. You only pay if you like it. Most pictures throughout your cruise are printed 8 x 10. 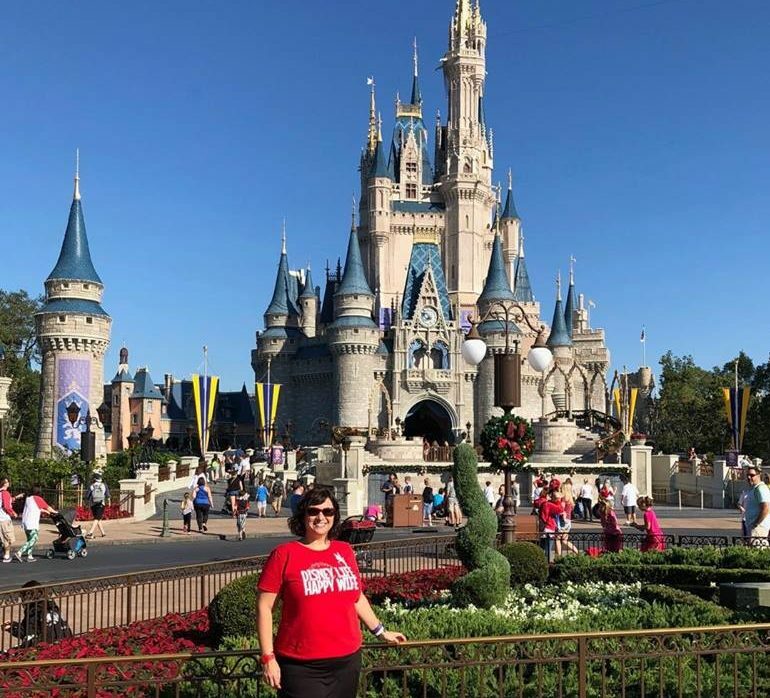 Another tip that I learned (too late on our trip to utilize it on our trip) – you can have the picture “re-printed” in a smaller size for the same 8 x 10 price, which is $19.99. Back to the pre-cruise photo- these pictures are typically $10 -$15 with the date on them. It’s a great souvenir. At about 11:35 a.m. we were allowed to board. Upon entry we received a glass of champagne or a mimosa. For the non-drinkers, they did not have orange juice for some reason. It was way to early for the rooms to be ready so we went up for some lunch. I wanted a burger and fries (and onion rings, but they did not have any) so our first stop was to the Mast Grill. They offered hot dogs, burgers and fries. Other cruise lines have chicken sandwiches, but not Celebrity. After, we headed over to the buffet (Oceanview Cafe) so my non-burger eating husband could get something. They have a HUGE selection in little stations. The food was very good. It was so early in the boarding process that it was not at all crowded. For the first day, if you arrive when loading starts, I would avoid the Burgers- they had been pre-prepared, which helps the quickness, but not the freshness of the food. While waiting for the rooms to be available we just relaxed in a chaise lounge chair on the pool deck. We had our carry-on bags still so we read, listened to music, and just relaxed. Around 1:30 we went down to our floor and the doors were opened- the cabins were ready! My dining preference was early seating with a 6 top table- both requests were honored. Something to note, the main dining room has a lot of 2-top tables, but most are located within 2 feet of another table, so you get served with the other table anyway. There are a few tables off on their own, but they are not the norm for a 2-top. Part of the fun is getting a table with other cruisers. It gives you more to talk about during the meal. The beginning nights include where everyone is from, what they do, etc. Then from there you can share and hear about what everyone did during the day. We arrived a little late to the dining room on the first night so as to not wait as long to be shown our table (we are big fans of waiting in fewer lines). You are shown to your seat since you need to learn your table’s location. Since this is true for everyone the first night, that line can get long. Dinner was terrific. I happened to keep track of the entree choices for the evening – lamb shank, salmon and spaghetti carbonara – one of my favorite dishes in Italian restaurants. The main meat dish of the night was Prime Rib, which was excellent. My spaghetti was good, but probably not as good as the prime rib. As do most lines, Celebrity offers an ‘everyday’ menu of choices you will see all week, which was listed on the left side of the menu. On the right side were that night’s selection of the evening. One of the best items on the ‘everday’ menu were the caprese salad, and my husband was a big fan of the caesar salad- which he ate EVERY night. You get to choose between an appetizer, soup or salad option, and the main dish. If there is more than one thing on the menu that you prefer, the waiter will bring you more than one of the course. The dessert menu comes after dinner. The everyday dessert menu has apple pie a la mode which I chose. It was fine. For my tastes, I enjoyed the desserts better on Carnival Cruise Line. But the entrees and appetizers were better on this cruise than any I had had before. After dinner there is a short break worked into the schedule to tour the ship, spend money in the shops, gamble, etc. The show the first evening was properly titled, “Opening Night” – a variety show sampling each of the shows for the week. It is great way to get an idea of what you want to see for the week. It was enjoyable. After the show, we called it a night and returned to our cabin. The room was ‘turned down’ during our time out at dinner. I was completely impressed with our room stewards- I had made a short list of things that I wanted to request- extra towels, extra sheet, little things like that. They were all in the room taken care of and the portion for the butler (provided for guests in a suite) was torn off the list and had been given to our butler. It was VERY impressive. They also leave you the next day’s copy of Celebrity Today – the little schedule of the events for that day. I always read it to see if there is anything that interests me in terms of activities for the next day. It is also where you learn the dining options and hours of availability during the day. After my review it was time for one of the best parts of cruising – the nice captain gently rocking you to sleep each night. We had a great night of sleep the first night on the ship! Stay tuned for the next installment of my cruise vacation!